This spring, it felt like it was never going to stop raining. And now, many of us are wishing for some rain in the 10 day forecast. As a result, our lawn and gardens are in the need of frequent watering. If your lawn is anything like mine, I am switching back and forth from a hose nozzle to a oscillating sprinkler everyday. First the grass needs watered to reduce the effects of the dog urine and intense heat on the lawn. Then the garden beds need watered because some of the new plantings have short roots and run the risk of dying from a lack of moisture. 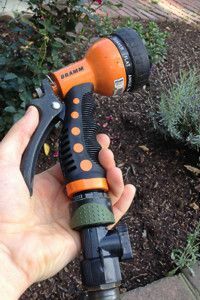 This constant battle to keep everything watered can be made easier with quick disconnect garden hose connectors. With quick disconnect hose connectors, you can switch back and forth between hose nozzles and sprinklers in a pinch. Simply pull back on the connector and the nozzle will disconnect from the hose. Then snap the hose to your sprinkler and you are all set to go! No more screwing and unscrewing nozzles when you are switching in between tasks. We stock quick disconnect connectors in both metal and plastic. There are kits to get you started and then all of the pieces are sold separately so that you can build the kit out to fit your needs. Stop by our lawn and garden department to see our full selection!